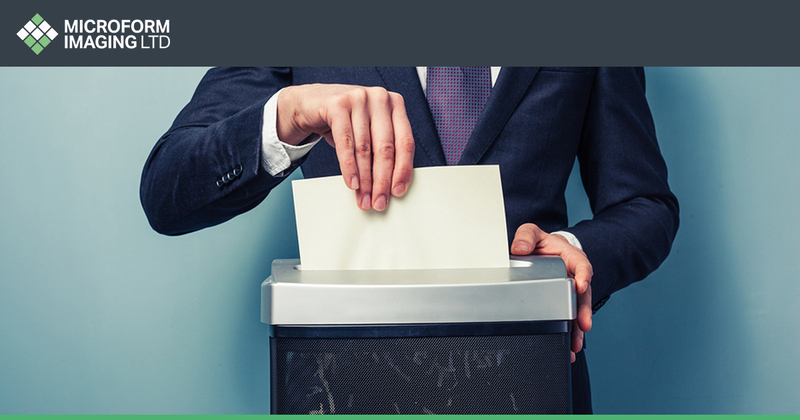 For businesses that are yet to go paperless, the shredding of paperwork and documents is incredibly important. In this article, we’ll discuss why effective and correct disposal of documents is important, and how Microform can help. As already discussed, there are best practices to consider when disposing of business documents, and one of these reasons is the fact that your company must consider the legal implications of not using proper disposal methods. For instance, if your business breaches certain privacy laws through the lack of proper disposal, you could face serious penalties. Some fines can total £500,000 for example, if you were to lose the confidential information of an employee. It is thought that identity fraud costs the UK around £5.4 billion per year, and that figure is only set to rise, but the proper disposal of documents means that you can prevent criminals to accessing important records and files. From bank statements, to personal addresses of employees or clients, documents with personal information are invaluable to criminals who will seek to find any piece of information that they can to assist them with their activities. All of this can be prevented from the shredding and recycling of important papers and documents. At Microform, we work with all kinds of businesses, which means that we have a good knowledge of items that need shredding from just about every industry. It is important that you shred any unwanted documents as soon as possible. Microform can help your company dispose and shred any and all documents associated with your business. What’s more, we work on a totally bespoke basis, which means that we can work with you on an ongoing basis if required, to ensure that your waste documents are shredded according to the very best practices. To ensure that all standards are met, we work with both Go Shred and Russell Richardson, two of the best and most qualified companies in the Yorkshire area that deal with confidential document disposal. So that we achieve the total destruction of all information, once that the documents have been shredded, they are also compacted and then sent for recycling. Up to 80% of the documents that pass through our doors are completely confidential, which means that we adhere to some of the tightest security and control measures in the industry, as well as a range of British Standards and accreditations. If you’re interested in having your business documents securely shredded and compacted, get in touch today by calling us on 0330 053 6300, or check out our contact page.